Q: What is the purpose of TechGearLab? Why did you start it? 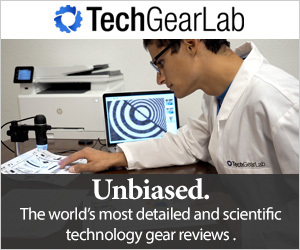 A: The TechGearLab mission is to create world's best tech product reviews. We strive to help our readers make smarter and more informed purchase decisions. If we've done our job right, our readers can rely on our reviews to help them choose the right product for their needs and budget. Learn more in our About TechGearLab page. Q: Do companies pay you to review their gear? A: No, we never receive money from companies for reviewing their gear. A: The revenue to fund TechGearLab comes from the support of readers like you. When you decide to buy a product that we've reviewed, click on the links which will take you directly to the retailer, such as Amazon. If our readers choose to make a purchase, the retailer will contribute a small portion of the sale to help support this site. If readers return their purchases because they are unhappy or feel the recommendation is bad, we make nothing. There is no incentive for us to pick inferior products; our focus is on helping you choose wisely, and purchase products which result in long-lasting satisfaction. It won't cost you anything extra, and it's a simple way to help us fund our gear review work. Q: How do you get the gear for your reviews? A: We buy all the products we review ourselves, at retail just like you, to help assure complete objectivity and independence in our ratings. We won't accept any free evaluation units from manufacturers. Q: How do you choose what to review? A: We look at hundreds of products to determine the top contenders in each category. To narrow down to the final set of products we compare side-by-side we rely on several factors. First, we consider the collective recommendations and experience of our Review Editors. Next we conduct research: looking very closely at user-reviews on products, collecting feedback from retail store personnel, and talking to industry experts. Q: How many products do you compare in a side-by-side review? A: It varies by category. On average, we test the top 10 products in a side-by-side comparison review. However in some cases we may compare as few as three top contenders, and sometimes more than twenty are compared. Q: What is your review process? A: Our Review Editors put the products through detailed side-by-side tests, both in the lab and in the field, and score each product across a range of weighted categories. We use and abuse each product to see how it holds up to its competition. Finally, we rank the products, explain why, and give awards to the best. Q: What is your motivation to give an objective review? A: We want to build a reputation as the most objective review site in the tech world. That is why in every review, we clearly post our dislikes with the product. We want you to know what the shortfalls of a product are and we hope to provide constructive criticism for companies to make their products better. In less than a year we have heard from multiple companies that have embraced feedback from our reviews in their future designs. Q: How can I be notified when new reviews are posted? A: New reviews are posted weekly. If you Like us on Facebook or Follow us on Twitter you will be notified when new reviews are posted. Q: Who does your web design? A: RJ Spurrier developed the web site. David Safanda Design Solutions designed our logo and award icons. A. You can reach us most easily by using our feedback form to send us an email.